Dressing babies for a chilly winter day can be tricky—after all, they can't tell you if they're comfortable, and we moms have a tendency to overdo it, rather than skimp, on the warm clothes. Here are some tips on how to dress that tiny baby of yours in the "just right" spot between too hot and too cold. A good guiding principle is to dress your baby as you're dressed, then add a layer. For example, if you're wearing a shirt, light sweater, and jeans, put your little one in a long-sleeved bodysuit, a shirt, a hoodie or sweater, and pants. If you're opting for a heavy winter coat as well, tuck your baby into a snowsuit or bunting, or layer on a couple of blankets. A couple of layers are a good bet for a baby who's spending the day inside. Start with a bodysuit or onesie and add a top layer such as a fleece one-piece with feet. If you're opting for pants and a top, socks under booties will keep those tiny toes toasty. With loose bedding like blankets a no-no, dressing your baby for sleep is especially important. Staying on the cool side is better than overdoing it: babies sleep better when they're comfortable and overheated babies are at greater risk for SIDS. Here again you'll want to do a few layers: a bodysuit with footed PJs, and depending on the temperature of the room, a sleep sack or a cotton swaddling blanket. Check your little one's neck to make sure he's not too sweaty. If your baby is in bed with you, she's benefiting from the heat of your body and doesn't need as many clothes as a crib-dwelling baby. A long-sleeved bodysuit and leggings or fleece sleeper might be all she needs when snuggled against mom. One way to determine if your baby is warm enough is to feel her toes and belly as soon as you come in from the cold. You want her toes to be on the cool side, but not cold, and her belly should feel warm. A baby with warm toes and a warm belly is overdressed. A cool belly means your baby is not able to warm herself and needs another layer, please! Puffy coats and snowsuits can make car seats straps too loose, a major safety hazard, so skip those if you're going by car. Blankets under the straps are a safety hazard as well. Snug blankets around your baby after he's buckled into his car seat, not before. If you live in a very cold climate, consider buying a car seat liner to keep your baby warm while commuting. Cozy stroller bags like this Infant Bundleme from JJ Cole are a snuggly way to keep your baby warm while you're out for a walk. Lined with fleece, these sleeping bag-style buntings have openings on the bottom that allow the straps to be threaded through and buckled. The top layer can be zipped off to control the temperature and allows for easy loading and unloading. Hats and Mittens and Hoods, Oh My! Your little one's head and hands need to be protected from the cold. A cozy hat that covers the ears and has a chin strap is a smart choice. Tug mittens over your baby's hands if they're exposed. Some infant bodysuits have tiny hand-covers at the cuffs, which will do the trick as well. A car seat cover or rain shield for a stroller help keep baby safe from the wet and windy winter elements. These covers help hold in heat as well, something to keep in mind when you're bundling up baby to head outside; you want your little one to be warm, but not sweltering. Remove covers as soon as you're indoors or snapped into the car. It's cold outside, but unless you're taking your tiny tot sledding—not recommended!—he's probably not going to be exposed to the frigid weather for very long. 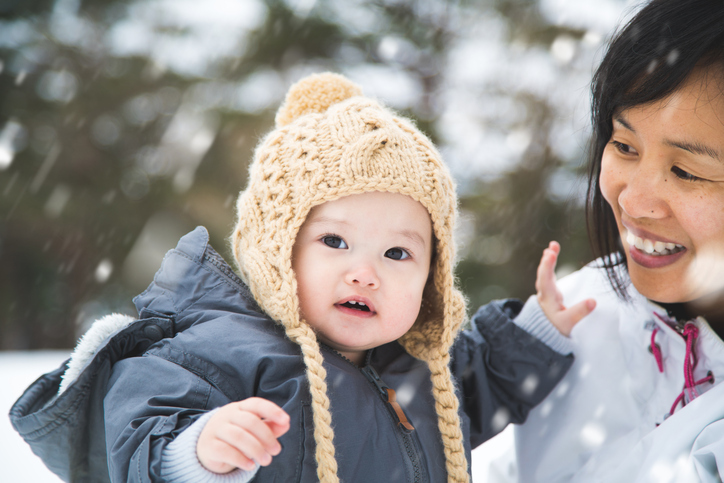 Bundle up your baby in layers when you're headed out, but be sure to peel a few of them off once you've made it to your toasty-warm destination. Your baby has as much trouble cooling off his body as he does heating it up.